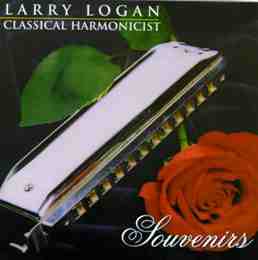 Larry Logan is properly listed among the elite few who have elevated the harmonica to the concert stage. Born in 1928 in Lafayette Louisiana, he began playing the harmonica at the age of eight. He was a natural, and at age twenty-one, launched a successful career that encompassed "thousands of concerts" from solo performances in school gymnasiums to variety shows with the likes of Vallee and Durante to tours de force with symphony orchestras. He has even played for the king of Siam. Larry Logan and his wife were quoted recently in the San Antonio Express: "The music business is a tough business," said Logan's wife, Rosemary, "especially being a harmonica soloist. Larry's really done some great things in his career, overcome a lot of obstacles." "See," said Logan, . . . "This instrument -- there's no market for it. There never has been. I had to create it. I took that and made a living at it, supported my family, played for royalty. It's all there for you, you just have to know what you want. That's what I used to tell the school kids. . . Hard work and discipline is the key." This CD -- Logan's first -- is the obvious result of hard work and discipline and is a fitting tribute to a great concert artist. It contains ten transcriptions and two original works (by Arthur Benjamin and Francis Chagrin) for harmonica: superb music and superb playing. Logan, at age 69, seems to be in his prime. I actually preferred this recording of Gershwin's Rhapsody in Blue over the recent recording by his older colleague and original inspiration for his career -- Larry Adler -- despite the fact that Logan was accompanied only by piano -- capably played by Jim Meredith -- while Adler was accompanied by a full symphony orchestra directed by George Martin. Logan's technique is still lightning fast and flawless. Bartok's Roumanian Folk Dances were a joy for me to listen to, especially as I have performed the set on both piano and accordion. Logan's interpretation is faithful to the composer's intentions. He explained his philosophy of transcription in the CD booklet notes, "Do I change the inherent quality of musical value of the piece by giving it another texture with my instrument? If after considerable study I decide that the musical and emotional content of the composition has not been compromised or diminished, then and only then do I feel that the purpose of the composer is being fulfilled." I have only one major complaint (and it is significant); the sound quality of several of the tracks is absolutely terrible. Several pieces were taken from earlier LP recordings and the scratches in the record are extremely distracting. The most notable offenders are Sevilla and the two Gershwin pieces. I really wish that Logan had taken his original LPs to a state-of-the-art digital editing studio and had those pops and scratches removed. Despite this grievance, I still recommend this CD for all lovers of classical free-reeds; albums with such great harmonica playing are rare.